Could it be that today's revelation that the pings detected off the coast of Australia may not have come from M370's black box (see above) may have been a motivating factor behind Malaysia Prime Minister's refusal to meet with the Chinese families whose relatives were on board the missing jetliner? May 28 (Reuters) - Malaysian Prime Minister Najib Razak will not meet with the families of Chinese passengers of Malaysia Airlines flight MH370 when he visits Beijing for the first time since the plane disappeared. Najib will meet President Xi Jinping, Premier Li Keqiang and head of parliament Zhang Dejiang during a six-day visit ending Sunday to mark 40 years of diplomatic ties, a Malaysian foreign ministry official told Reuters. But Najib will not meet the families of missing passengers, about two-thirds of whom were Chinese. A spokesman for Najib's China delegation told Reuters on Wednesday he could not immediately comment on why there would be no meeting. "We've asked [Najib's office] today, we asked yesterday and the day before that. We've been demanding it for a month now with no response," said a family member surnamed Xu. "It's not right, he has an obligation to meet with us." Najib Razak said this was the conclusion of fresh analysis of satellite data tracking the flight. The announcement by Prime Minister Najib Razak came at a late-night news conference in Kuala Lumpur. It was based on new analysis by British satellite firm Inmarsat, which provided satellite data, and the UK's Air Accidents Investigation Branch (AAIB). The firms "have concluded that MH370 flew along the southern corridor, and that its last position was in the middle of the Indian Ocean, west of Perth," Mr Najib said. Mr Najib appealed to the media to respect the privacy of the families of the passengers and crew, saying the wait for information had been heartbreaking and this latest news harder still. Malaysia Airlines later said it informed the majority of the families in advance of the prime minister's statement in person and by telephone, and that text messages "were used only as an additional means of communicating with the families". The text messages read: "Malaysia Airlines deeply regrets that we have to assume beyond any reasonable doubt that MH370 has been lost and that none of those on board survived... we must now accept all evidence suggests the plane went down in the Southern Indian Ocean." (CNN) -- The 850-square-kilometer swath of the Indian Ocean where officials have focused their hunt for missing Malaysia Airlines Flight 370 probably isn't the right place, the joint search agency said Thursday. Yesterday afternoon, Bluefin-21 completed its last mission searching the remaining areas in the vicinity of the acoustic signals detected in early April by the Towed Pinger Locator deployed from ADV Ocean Shield, within its depth operating limits. The data collected on yesterday's mission has been analysed. As a result, the Joint Agency Coordination Centre can advise that no signs of aircraft debris have been found by the Autonomous Underwater Vehicle since it joined the search effort. Ocean Shield departed the search area last night and is expected to arrive at Fleet Base West on Saturday. ◾acquiring the specialist services required for a comprehensive search of the sea floor in that area. The expert satellite working group continues to review and refine complex analyses of radar and satellite data and aircraft performance data to determine where the aircraft most likely entered the water. The findings of the review will be made public in due course. The Chinese survey ship Zhu Kezhen has already begun conducting the bathymetric survey—or mapping of the ocean floor—of the areas provided by the ATSB. Its operations are being supported by the Chinese ship Haixun 01 and Malaysian vessel Bunga Mas 6 which are assisting with transporting the survey data to Fremantle weekly for further processing by Geoscience Australia. A contracted survey vessel will join the Zhu Kezhen in June. The bathymetric survey is expected to take about three months. Knowing the seafloor terrain is crucial to enabling the subsequent underwater search. The ATSB will shortly release a formal request for tender to source the capability to undertake the underwater search. A single prime contractor will be chosen to bring together and manage the expertise, equipment and vessels to carry out the search. Considering today's affirmation by JACC ... could it be that the US Navy's dismissal of yesterday's revelation of Michael Dean, US Navy's director of ocean engineering ... yesterday's revelation that pings detected off the coast of Australia were not MH370 related ... could be considered damage control? CANBERRA, AUSTRALIA—Investigators searching for the missing Malaysian jet have concluded an area where acoustic signals were detected is not the final resting place of the plane after an unmanned submersible found no trace of it, the search co-ordinator said Thursday. The U.S. Navy’s Bluefin 21 finished its final underwater mission in the southern Indian Ocean on Wednesday after scouring 850 square kilometres, the Joint Agency Coordination Center said. “The area can now be discounted as the final resting place” of the missing plane, the Australia-based centre said in a statement. The underwater search for the airliner, which vanished March 8 with 239 people on board en route from Kuala Lumpur to Beijing, will be suspended for a couple months while more powerful sonar equipment is brought in to search a much wider area of 56,000 square kilometres, based on analysis of satellite data of the plane’s most likely course, the centre said. The families of the victims — many of whom have been highly critical of the Malaysian government and, in the absence of any wreckage, have been unwilling to accept that their loved ones are dead — had been asking for the raw satellite data for many weeks so it could be examined by independent experts. Malaysia initially balked at doing so, but then reconsidered. The Chinese survey ship Zhu Kezhen which is conducting the bathymetric survey—or mapping of the ocean floor—is enroute to the port of Fremantle. Zhu Kezhen suffered a defect to its multibeam echosounder and is coming into port to conduct the necessary repairs. The journey is expected to take a couple of days. As previously advised, an Australian contracted survey vessel will also be involved in conducting the bathymetric survey and will arrive in the search area in June. Further information regarding the movements of Zhu Kezhen will be advised if, and when, more information becomes available. HONG KONG — Scientists plan to release detailed information on Wednesday about a mysterious noise, possibly that of an ocean impact, recorded by two undersea receivers in the Indian Ocean about the time that Malaysia Airlines Flight 370 ceased satellite transmissions and vanished on March 8. The low-frequency noise, which was outside the normal range of hearing and had to be sped up to be made audible, appears to have traveled halfway across the Indian Ocean to the receivers off the coast of Australia. “It’s not even really a thump sort of a sound — it’s more of a dull oomph,” said Alec Duncan, a senior marine science research fellow at Curtin University near Perth, who has led the research. The general vicinity from which the noise emanated is a large area of the central Indian Ocean off the southern tip of India and about 3,000 miles northwest of Australia. But that is not consistent with calculations of an arc of possible locations in the southeastern Indian Ocean where the plane, carrying 239 people, might have run out of fuel. Those calculations were from Inmarsat, the global satellite communications company. Scientists have struggled to figure out the origin of the noise. The private contractor hired to find Malaysia Airlines 3786.KU 0.00% Flight 370 will have 300 days to complete an undersea search for the missing jetliner in the southern Indian Ocean. Tender documents released by the Australian government on Wednesday outline for the first time the requirements of the rebooted search, the largest of its type in history. But they also highlight continued uncertainty about the operation, including the terrain of the seabed and even the area to be scoured using high-tech sonar equipment. The Australian Transport Safety Bureau said it still hasn't fixed upon an exact search area because it is continuing to analyze satellite communications and calculations on the Boeing 777's likely performance. It didn't elaborate, although experts say there has been no new data for several weeks. The winning contractor faces a number of aggressive deadlines to search an area of 60,000 square kilometers—roughly equivalent to the size of West Virginia—as authorities make a fresh attempt to locate wreckage of the plane, which disappeared on March 8 with 239 people on board. An extremely low frequency signal which travelled thousands of kilometres through the Indian Ocean to underwater detection stations off Western Australia’s coast could have been the sound of Malaysian Airlines flight MH370 hitting the water. Scientists warn it is more likely to be the sound of a small earthquake but could nevertheless be used to refine the search area. The brief signal was detected by a sound recorder sitting on the ocean floor west of Rottnest Island, next to Perth, just after 9.30am WST on March 8. That was later matched with a signal picked up by a separate underwater listening station operated by the United Nation’s Comprehensive Nuclear Test-Ban Treaty Organisation, 140km off Cape Leeuwin. Curtin University’s Centre for Marine Science and Technology has been analysing the data since early April. The centre’s senior research fellow Alec Duncan told a press conference today the bearing for the signal was in the same north-westerly direction as the search area identified by the Joint Agency Coordination Centre (JACC). However, the range was about 1000km further away than the search arc plotted by satellite “handshake” data in the southern Indian Ocean. Dr Duncan said, though, that what had interested his team and search authorities in Canberra was that the bearing for the signal intersected directly through the middle of the MH370 search arc. “The time of arrival of that signal was reasonably consistent with what we knew about the loss of the aircraft,” he said. He was careful to point out the most likely scenario was that the signal was not from MH370 but was probably from a small earthquake. He said there was a 90 per cent chance it was not from the plane. Flight 370 "will be found" near "7th arc"
The Australian agency responsible for the Indian Ocean search for missing Malaysia Airlines Flight 370 reiterated its belief Thursday that the missing Boeing 777 would be found in the southern Indian Ocean. The Australian Transport Safety Bureau, working in conjunction with a team of international investigators, said further analysis of the satellite data available on the flight's path "confirms that MH370 will be found in close proximity" to a specific corridor identified as the "7th arc". In a statement released Thursday, the ATSB said at the time Flight 370 reached this specific arc, "the aircraft is considered to have exhausted its fuel and to have been descending." 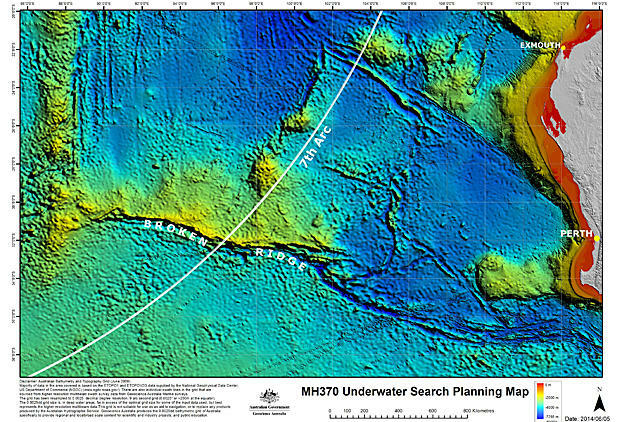 It was not immediately clear where the 7th arc, shown below on a map provided by the ATSB, lays in relation to the area already searched already by a U.S. Navy robotic submarine. The Bluefin 21 sub concluded its fruitless search of a swath of the Indian Ocean floor that investigators had believed was the most likely crash zone at the end of May. The search for the doomed Malaysia Airlines Flight 370 has been moved to another area of the Indian Ocean dubbed "the 7th arc" following new analysis of satellite communications from the doomed jet, Australian officials said Thursday. The new target area was revealed a week after officials completed a search of the previous target area with no sign of debris. "The latest information and analysis confirms that MH370 will be found in close proximity to the arc," the Australian Transport Safety Bureau said in a statement. "At the time MH370 reached this arc, the aircraft is considered to have exhausted its fuel and to have been descending." The bureau said the plane probably crashed within 60 miles of the sweeping arc — a massive area of the globe that the bureau said it will trim to a "prioritized" 17,500-square-mile search area. The underwater search will aim to locate the aircraft and any evidence (such as aircraft debris and flight recorders) to assist with the Malaysian investigation of the disappearance of MH370. That search was scheduled to begin in August and take up to 12 months, JACC said. The search for missing Malaysia Airlines flight MH370 will focus on the "7th arc" in the Indian Ocean, based on new data and analysis, the Australian Transport Safety Bureau (ATSB) says. The ATSB says the area off the Western Australian coast is where the plane is believed to have exhausted its fuel supply and been descending. It is also the area where the last satellite contact occurred with the aircraft. "As a result, the aircraft is unlikely to be any more than 20 nautical miles (38 kilometres) west or 30 nautical miles (55km) east of the arc," the ATSB said. The total extent of the arc is from latitude 20 degrees south to 39 degrees south. The ATSB says the underwater search area is likely to be reduced in coming weeks to 60,000 square kilometres. MH370 went missing in March with 239 people on board, including six Australians, while en route from Kuala Lumpur to Beijing. Earlier this month it was revealed that acoustic pings thought to be from the plane's black boxes were not related to the aircraft. The pings prompted a multinational search that covered 4.64 million square kilometres of ocean but there was no sign of wreckage from the missing plane. It is now thought the pings probably originated from one of the search ships. I hope there will be answers. They're trying their best--well, at least Australia. I need to be patient and remember that it's a very challenging endeavor. At the beginning, someone said the search was like finding a needle in a haystack, but we have to find the correct haystack first. I think that the 7th arc is the correct "haystack." Now we wait. BEIJING — Relatives of passengers on Malaysia Airlines Flight 370 are launching a crowd-funding campaign to raise a $3 million reward for a whistle-blower to expose key information about the vanished jetliner, the partner of a missing passenger told USA TODAY. A $2 million fund for private investigators to follow up on promising leads is also being targeted. Almost three months after the plane disappeared en route from Kuala Lumpur to Beijing, some relatives are frustrated by the failure of the official search to find concrete evidence about what happened and in what manner, and they say they are convinced that authorities are concealing the truth. "We are taking matters into our own hands," said Sarah Bajc, a U.S. citizen whose partner, Philip Wood, 50, an IBM executive from Texas, was on the flight when it disappeared March 8. "There is no credible evidence" the plane is in the southern Indian Ocean, where planes, boats and a mini-sub have searched in vain for weeks, she said. "I'm convinced that somebody is concealing something," said Bajc, 48, a business studies teacher in Beijing and former executive with Microsoft. The head of the Australian joint agency overseeing the search rejected the families' claims. "Nothing important is being concealed in any way," said Angus Houston, a former air chief marshal of Australia. "My approach has always been to be as open as I could possibly be," he told USA TODAY. For the third time in less than three months, investigators looking for Malaysia Airlines 3786.KU 0.00% Flight 370 are poised for a shift in search areas after revising some of their basic assumptions, according to people familiar with the process. The latest rethinking, these people said, reflects inescapable uncertainties about the speed, flight path and altitude of the Boeing BA -0.37% 777, which mysteriously veered off its flight plan on March 8, flew on for hours and is believed to have run out of fuel before going down in the remote southern Indian Ocean carrying 239 people. But until the aircraft is found, such assumptions are still educated guesses. Changing the assumed speed, trajectory and altitude, though, can result in sharply divergent underwater search areas, possibly taking teams significantly south or southwest from where they focused their efforts in May. KUALA LUMPUR, June 9 — Groups representing the families of the passengers and crew aboard Flight MH370 issued a letter of thanks to the governments and teams involved in the search for the missing plane, but the Malaysian government was conspicuously absent from the list. Voice 370 and MH370 Family Association, in a joint letter addressed to Australian Prime Minister Tony Abbott and Joint Agency Coordination Centre (JACC) chief coordinator Angus Houston, said they deeply appreciated the efforts by all involved in finding the elusive aircraft. “This incident has no such precedent through the history of aviation, and we would like to highlight the progress made toward understanding the events unfolding in the morning of March 8 and fate of the plane in the face of innumerable obstacles and complications,” the letter read. The families thanked Abbott and Houston for “their gracious assumption of responsibility for the coordination of the search” in the southern Indian Ocean where the plane is believed to have ended its flight. “Their calm and able handling of the situation has assured the families that this responsibility has been passed to capable hands,” said the letter. The families also made a special mention of the “considerable assistance” extended by the governments of China and the US, describing the commitment and scale of their contributions as “commendable”. grace-land, thank you for the updates. Just so odd . . . really . . . trying to find the correct haystack.